Have you ever wandered the aisles in a drugstore looking for new treatment options for your acne? The shelves are filled with products all promising to be the exact solution you’ve been looking for. But how can you tell which ones actually work and which just have good marketing? The last thing you really want to be doing is trying them all out. That’s going to be an expensive trial that could actually make things worse. Constantly switching between products will also never really tell you what’s working and what’s not. So, the first thing to do is weed out all those products that are not effective and just come with a huge price tag to pay for the marketing. And to do that you need to take a close look at the options available below. 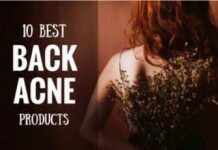 On this page you will find the best drugstore acne products that are available without prescriptions. They are effective at helping to treat an outbreak, and unless it’s a very severe situation you can avoid costly trips to doctors and medicated prescription options. Just pick one for your skin type and see how quickly it will help you recover. check Penetrates into your clogged skin pores. check Protects your skin from likely breakouts. 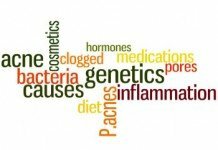 check Reduces inflammation and rejuvenates your skin over time. A refreshing and soothing acne treatment. check Works for acne, spots, scars, cystic & hormonal acne. check Suits all skin types. check Has a refreshing smell. Although, each of the products I’ve listed in this post is a winner, they still do not work for everyone. So to determine whether or not a particular product will work out for you, it’s important to be well aware of your skin. And here’s how to do it. Skip this section if you already know your skin type. Cleanse your face with a mild cleanser to remove any toxins or dirt that might be sticking to your face, and pat dry it afterward. After waiting for 45 minutes, while not touching your face and being in a polluted environment, dab your face with a tissue, preferably the T area of your face. If the tissue has oil on it, then your skin is oily. If it’s rather flaky, and doesn’t have oil, then your skin is dry. Or if the tissue neither has oil, nor it’s flaky, then you have normal skin. AND, if the tissue has oil onto it, as well as it shows flakiness, then you have the most common skin type, combination skin. After you’ve determined your skin type. 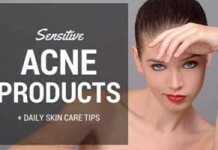 Next important step is to understand different ingredients these drugstore products use to fight your acne. Knowing them better will help you pick the product that’s going to work best on your specific skin type and condition. So, let’s get into it right away. It works as the main tool against acne causing bacteria in a lot of acne treatments. Packed with natural anti-bacterial properties, benzoyl peroxide also helps controlling excess oil production and shedding dead skin cells, which ultimately helps opening clogged skin pores and fading acne. Over the counter benzoyl peroxide treatments come in different concentrations from 2% all the way to 10%. This ingredient is also notorious for its bleaching effects on cloths. Its possible side effects include dryness, redness, scaling, burning and stinging. Salicylic acid, being a beta-hydroxy-acid is particularly effective in penetrating deep into the skin. Its chemical structure makes it oil solution and capable of penetrating the skin, where it breaks down the inter-molecular glue of skin that holds skin cells together (including dead skin cells). This provides your skin with a deep cleanse and makes it free of excess oil buildup, bacteria, and dead skin cells. 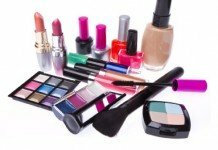 Most drugstore acne products employ it in concentrations of 0.5% to 5%. It can cause mild stinging and skin irritation as side effects. Glycolic acid and lactic acid are the two alpha hydroxy acids that are used in over the counter acne treatments. AHAs are synthetic chemicals derived from sugary fruits. Like salicylic acid, they help removing dead skin cells and reduce inflammation. But where they outshine their counterparts is their ability to boost collagen which is essential for improved cell turn over and elasticity of your skin. 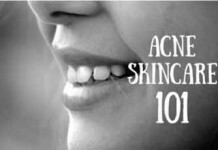 This is why AHAs play an important role against acne scars, wrinkles and fine lines. Foods high in sulfur such as parsley are good for skin complexion. Added as an active ingredient, sulfur helps shedding dead skin cells and reducing excess oil on the skin. 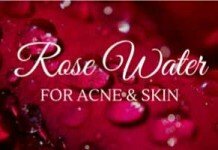 It is also effective for curing rosacea. Because of its alleged ‘rotten-egg smell’, it is often combined with other ingredients to help fade away the odor while still reaping its full benefits. Being an anti-bacterial and anti-inflammatory agent, it is often considered a prominent alternative to benzoyl peroxide. If you’re looking for a natural acne treatment, go for the products containing tea tree oil as active ingredients. According to some reports, a 5% tea tree oil based treatment can be as effective as a 5% benzoyl peroxide product. However, it can turn out to be too harsh for some people, specially with sensitive skin. And it also has a tendency of causing allergic reactions. 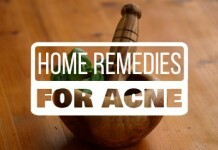 Apart from these issues, tea tree oil based products are proven effective against acne. This is another anti-bacterial agent that fights P. acnes, exfoliates dead skin cells, and removes excess oil from the skin. It’s mostly found in acne treatment creams and gels, and works best for mild to moderate acne. Retinoids include different vitamin-A derivatives including adapalene (Defferin), tretinoin (Retin-A), and tazarotene (Tazorac). Apart from being effective at opening clogged skin pores by exfoliating your skin, retinoid-based acne products known for their anti-ageing benefits. They boost collagen, tighten up wrinkles, and fade fine lines. Because they possess exfoliating properties, common side effects of retinoids include dryness, irritation and redness. It is always recommended to follow up retinoid acne treatments with a non-comedogenic moisturizer. Because of its natural anti-inflammatory properties, witch hazel is a prominent astringent in most beauty products and a popular anti-acne ingredient as well. Its targets excess oil and help cleanse off blemish causing dirt and brim from the skin. 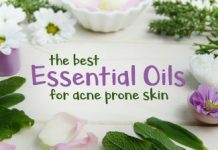 Although it works well as a non-active ingredient in acne treatments, it is not to be taken as standalone treatment for moderate-severe conditions. It is well known for its anti-inflammatory properties. A study published in 2006 found it effective at controlling excess oil on the skin. Altogether, it is a suitable choice for oily acne prone skin as it will fight oil-induced zits and make your pores smaller. Mud or clay masks have always been there. This earthy ingredient work as magnets to draw dirt and oil out of your skin. It also helps shrinking your pore size and provide astringent benefits to your skin. 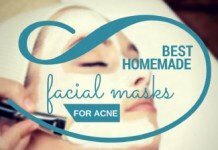 It works best in blackhead masks because there’s plenty of time for it to sit and absorb all the oil and brim that your skin has caught through the day. Clay masks do not overly dry your skin as it happens with other known astringents. But if you’re not comfortable, you can also use them as spot treatments. It is also a vitamin-A derivative. 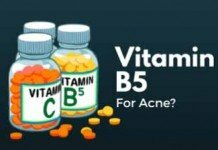 You might have better known it in oral form (accutane) but it’s also applied topically for treating severe acne conditions. In fact, it treats severe acne like no other treatment. But there’s often a great cost associated with it, and for this reason it’s never recommended to go for it without a physician’s advice. It can cause dryness to such extent that it takes over your face, lips, and even the inner mouth area. Photosensitivity, nosebleeds, headache, rash, stomach issues and achy muscles are among its other potential side-effects. Which Concentration of Active Ingredients is Good For You? Generally, lesser the concentration, the lesser your chances are for catching a side effect. Sensitive skins are at much more risk when using highly concentrated acne treatments. But higher concentrations are made for purpose. Products employ them because they show efficacy in treating certain types of skin and acne conditions (specially the severe ones). 2-5% concentrations of most active acne ingredients are on the safer side. Anything above this, you should make absolutely sure that you know what you’re doing. Understand the product completely, be also very educated about your skin and acne condition, and preferably also consult with a Derm before going for any higher concentration acne treatment product from your drugstore. 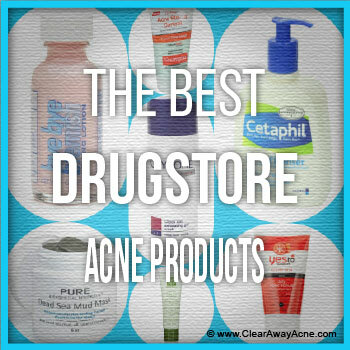 Now that you’ve discovered all active ingredients, it’s time to review the best drug store acne products you can purchase containing them. It’s been proven time and again that an acne treatment system, rather than a stand-alone product, always provides better results. 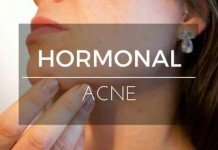 The main reason is the fact that acne is a complex problem. And combating it requires far more practical actions than just cleansing your face twice a day with a medicated face wash. Exposed has been around for over a decade now, and its success rates have been on a rise ever since, compared to its counterparts like Murad and Proactiv. 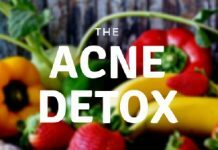 It takes on a multi-dimensional approach to fighting acne with the following features. The salicylic acid facial cleanser penetrates into your clogged skin pores, making it easier for the medication to fight harmful residue that might be causing your acne. Acne treatment serum included in the kit fights acne causing bacteria, which helps banishing inflamed blemishes. Clear Pore Serum is a leave-on treatment that protects your skin from likely breakouts while you’re asleep. The Clearing Tonic present in the basic kit is a salicylic acid + azelaic acid acne treatment that reduces inflammation and rejuvenates your skin over time. Being an acne treatment kit doesn’t mean it costs earth. 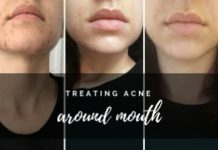 Exposed 30-Day Kit is available at the same (or even lesser) price of most standalone top acne products we’ve featured in this post. If you’re taking on the basic kit (which I recommend in the start against the expanded, 6-piece kits), you’ll have 4 core products to go with. You can cleanse your face with facial cleanser twice a day. Before sleeping, put on the Clear Pore Serum evenly on your skin and leave overnight. Benzoyl peroxide serum can be used as a spot treatment for acne, but make sure to go through the detailed guide in their membership area where they have detailed guides on the best usage of their kits according to your acne condition. Start using these products with a patch test (specially the Clearing Tonic) to make sure they suite your skin and don’t cause irritation. Due to its formulation, Exposed acne treatment tends to first worsen your acne condition and then gradually reduce blemishes on your skin. This is a frustrating period, but make sure to be patient and let the results come in. If you don’t observe visible results within the first 4-5 weeks (or your acne keeps worsening), stop using the product and request a refund (they have 1 year money back guarantee). Keeva tea tree oil acne treatment cream with DL-Menthol is a refreshing and soothing acne treatment and the first of its kind since it doesn’t dry your skin like other acne treatments thanks to its main ingredients being organic tea tree oil and salicylic acid. Uses organic tea tree oil (a natural alternative to benzoyl peroxide’s anti-bacterial properties), salicylic acid (proven pore opening ingredient) & hyaluronic acid (effective for skin rejuvenation) as its main ingredients. Has a refreshing smell and leaves your skin moisturized. After cleansing your face with Keeva Clarifying Acne Face Wash or Keeva Tea Tree Soap for Acne Apply Keeva tea tree oil Acne Treatment Cream directly to your pimples and acne spots for an effective and natural acne treatment that works in days not months. Repeat Daily. All Keeva products are made with natural organic ingredients, if you suffer from allergies to any of the natural ingredients labeled please do not use their products. Christina Moss Naturals is known for offering proven all natural organic products. This Facial wash is also fetched from the right organic composition to give your acne prone sensitive skin a relief! Fights acne effectively, while being gentle on the skin. With its regular use, it helps in removing the excess oils, dead skin cells, and toxins, and leaves your skin with a soothing sensation. 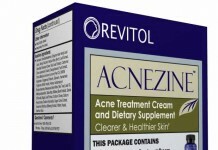 100% natural and organic acne treatment. Wet your face with clean water. Take a small amount of liquid and massage on your face (avoiding eye area). Leave it for maximum 5 minutes and then rinse it off with water. It is better to use it with other Christina Moss Naturals acne treating products for better results. 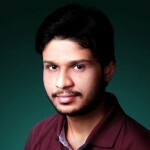 As it is effective to handle the acne with a range of same product line like a moisturizer. Using it regularly twice a day will eventually show you the lively results. Be patient for worthy outcomes. Simply the best and the most popular product when it comes to taking charge of your acne filled face. Cetaphil is the most prominent U.S. based company, which has earned 80+ awards nationwide and worldwide for its expertise in providing effective and gentle acne treatments. 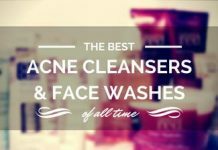 Update: I’ve recently published a dedicated blog post reviewing the top 10 acne fighting cleansers. You may check it out. This flagship product from Cetaphil effectively cleanses your skin, leaving your skin with a soft and shiny glow. It’s gentle enough that even delicate baby skin can tolerate it, and efficient enough that it removes dirt and make-up without stripping the skin of its natural protective oils. Specially designed for the usage of all skin types, so you don’t have to worry which type of skin you have. Cetaphil Cleanser can be flexibly used in a variety of ways (see below). You can use this cleanser from Cetaphil with or without water. You can either simply apply a decent amount to your face, massage it gently, and remove the excess with a dry washcloth, and just leave a thin film on the skin. OR, as usual, you can apply it and massage gently, then rinse it off with water. Get your hands dirty with this astonishing mask for blackheads brought right from the dead sea for the aid of your skin! Another effective treatment for acne and your overall skin care that can be used regardless of your skin type and age. It gently exfoliates your skin and removes excess oils, dead skin cells, and toxins, and leaves your skin with a soothing sensation. The essential minerals found in this mud helps in your skin’s rejuvenation. Apply a medium thick layer of this mask on your face (avoiding eye area), and any other area of your body you wish. Leave it for at least 10-15 minutes to allowing it to become settled on your skin. Once it is completely dried, rinse it off with lukewarm water while gently massaging your skin with circular motions. You would be better off using it as a stand-alone acne treatment. That’s not because it can conflict with other products, but because it’s effective enough that it can handle it all on its own. Make sure to not use it more than twice a week. Regular and unnecessary application of this mud mask can end up leaving your skin dry. It’s, by far, the best scrub for the price, used for the purpose of treating and preventing acne. 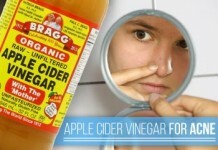 Effectively eliminates blackheads and whiteheads in particular. Makes use of the cutting edge MicroClear technology. It goes deep inside your skin, and prevents pore clogging. It also assists acne medicine to go deeper in your skin for destroying acne from where it starts (the sebaceous glands). Unlike the majority of the scrubs available in the drugstores, this one from Neutrogena doesn’t irritate your skin that much. The scrub clears, softens, and gently exfoliates your skin to leave it smooth and even. Apply on a wet face, and massage very gently. Avoid contact with the T-area of your face. Rinse your face thoroughly afterward. Ideally, it should be used if you have very oily skin although there isn’t a big risk as it’s known to be a gentle cleanser. Some users complain that it irritates the skin in the beginning, but after using it for a few weeks, the condition comes back to normal. But it’s recommended that you shorten the use of it if it irritates your skin in the beginning and gradually increase the application if it doesn’t. Cleansing Pads are considered to be the fastest way to treat your acne. And when it comes to finding the most effective and dermatologists’ tested pads, these ones from Clearasil are the deal. Using salicylic acid in 2% concentration, these pads from Clearasil provides you with a dermatologists tested maximum strength acne medication. Besides having the ability to eliminate blackheads and whiteheads, Clearasil Pads are also able to visibly reduce your pimple sizes in a short period of time. But for the complete elimination of your lesions, it obviously requires more time. Wipe pad gently over face and neck, avoiding eye area and leave for a while. Do not rinse off your face until it becomes completely dried. ALWAYS Replace the lid tightly after using it. Because it’s a maximum strength treatment, it can cause dryness and irritation in the beginning. It should be used once daily at the start. And if it doesn’t dry or irritate your skin, gradually increase its application for even more effective results. You have to be careful if your skin is sensitive. Reach out your Derm and ask him if it’s the right one for you. It’s officially claimed to be the “Hollywood’s Secret Weapon” against pimples. Well… I can’t confirm if it’s true or not. 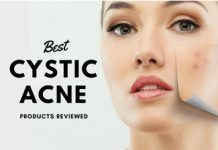 But the real thing is that it DOES work for people, and have dozens of positive reviews from people over at Amazon and other prominent skin care sites. This is the only known drugstore acne product to me that is less irritating, gentle enough, and easy to use, and is highly effective in getting rid of acne, regardless of your age or skin type. This treatment makes use of both Sulfur and Zinc Oxide as it’s core ingredients. Means that you get a similar treatment to Proactiv products for a much smaller price. Just like all other acne treatments, Bye Bye Blemish Lotion can make your skin dry out in the beginning, but once your skin starts to become familiar with its ingredients, it gradually go back to normal. Dip a sterile cotton swab into pink sediment. Because excessive drying of the skin may occur, limit use to one application daily or as directed by a physician. Cleanse your face thoroughly with a good moisturizing soap like Dove before applying it to your skin. Never use any other topical product in conjunction with bye-bye blemish lotion to avoid possible excess dryness and irritation. Don’t ever commit the mistake of shaking the bottle before using it, only use it when it’s settled. The flagship product from Glytone company, which is prominently used by skincare enthusiasts all over the world. The gel makes use of 4.7% Free Glycolic Acid to remove dead surface skin cells and inhibit P. acnes bacteria that ensures a brutal fight against your acne. Glycolic acid in this gel helps in skin rejuvenation. The best choice if you’re looking for a gentle exfoliating agent for an oily skin, but can also be used for normal and combination skin. It works perfectly fine during summer, but it becomes a little harsher if used in severe cold. Dispense a small amount into hand and mix with a little water. Massage over wet face and neck in circular motion. As it can be a bit harsh in the beginning, it’s good to start using once daily and then gradually increase the application as your skin begins to respond well. Don’t use any other product when using this gel from Glytone, especially if they are scrubs, to avoid excess dryness but using a good moisturizer is an exception here. Not from the most sophisticated cosmetic companies, Break Out (Botencial Acne Gel) is the most popular product of Kiss My Face, which uses 70% organic ingredients to treat your acne. Making use of organic ingredients like peppermint, lavender, rosemary, sage, red clover, and many more, which are all certified by Quality Assurance International, this gel from Kiss My Face makes sure that you get an effective acne treatment while not exposing yourself to any side-effects. It can be used for all skin types without hesitation. Contains tea tree oil, which is proven for effectively fighting against acne causing bacteria. You don’t need a refill very often, because you only have to apply it in small sized amounts. Preferably, botanical acne gel should be used after thoroughly cleansing your skin with a mild exfoliating wash. Apply a small sized amount gel over the blemishes, pimples, or spots once in the morning, and then in the evening. Officially claimed to be the #1 recommended acne treatment kit from dermatologists, this product from Neutrogena seems promising enough from the aspect of its popularity and non-intuitive approach to treating acne. But these three must be used in a step by step prescribed method, which I’ll outline below. Salicylic acid in the Skin Polishing Acne Cleanser unclogs your skin pores by gently exfoliating your skin. Benzoyl peroxide in the Acne Control Lotion eliminates acne causing bacteria residing deep in your skin pores, eventually reducing your pimple size and inflammation. This works more effectively when you’ve unclogged your skin pores using the cleanser described in the preceding paragraph. The botanical ingredients in the Oil-Free SPF 15 Lotion provides your skin with a natural soothing sensation. Its application becomes even more important after applying compounds like benzoyl peroxide and salicylic acid to your skin, which might potentially leave your skin dry or irritated. This lotion will take the situation under control by making use of the natural soothing effect of its ingredients. The first step is to cleanse your face with Skin Polishing Acne Cleanser in the morning. Apply it on a wet face, massage your face gently, and then rinse it off with lukewarm water. When you’ve cleansed your face thoroughly, apply the Oil-Free SPF 15 Lotion to your exposed areas if you want to go outdoors. It’ll protect you from sunburns, pigmentation, and dryness that the cleanser can possibly cause. In the evening, if you feel comfortable enough, cleanse your face thoroughly with the Skin Polishing Acne Cleanser again. Before going to bed, apply Acne Control Lotion to your face to prevent future acne breakouts while you’re asleep. Make sure you’re not allergic to the prominent ingredients of this acne therapy system like benzoyl peroxide and salicylic acid. It’s better to use the Skin Polishing Acne Cleanser daily, but if you experience excess dryness and peeling, limit the use of it to alternative days. If you feel it is necessary, you can apply the Oil-Free SPF 15 Lotion more than once a day to protect your skin from dryness and the sun’s damaging rays. A reasonable product from Yes To, which makes use of a combination of tomatoes, bisabolol and ginger, and salicylic acid to make an effective scrub for the treatment of mild acne. Specializes in blackheads and whiteheads removal. Herbs like bisabolol and ginger in this scrub help in reducing inflammation and irritation on your skin. Tomatoes are proven to be an effective treatment to resist the excess sebum production and pore clogging, and this scrub takes full advantage of its natural capabilities. 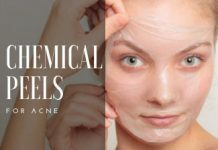 Salicylic acid is another ingredient that is proven to fight ruthlessly against pore clogging and the formation of blackheads and whiteheads. Take a bit of scrub in your palms, apply it to your face, and gently massage. For more severe blemishes, yes-to tomatoes scrub can be used twice a day, but only if it doesn’t irritate your skin. Use it once daily, or even twice, but if doesn’t respond well, shorten its use. You would do better to avoid it if your skin is too dry but it’s perfect for a light to severe oily skin. I’ve read folks complaining about the allergic reactions it caused to them and their unsightly outcomes. Therefore, I’d recommend whenever you observe your face turning red, itchy, scaly and bumpy, STOP it’s usage right away. Don’t be misled by its size or price. This cute little roll-on is among the top products you can get at your drugstore to treat your acne. Unbelievably cheap; but that doesn’t mean it’s crap. Contains salicylic acid, which prevents your skin pores from clogging. 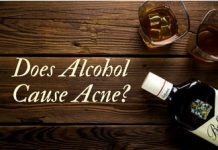 Ingredients like tea tree oil, witch hazel and camphor makes it a complete product that effectively fights and prevents your acne, minimizes redness and swelling, and provides you with clear skin. Your face should be thoroughly cleansed before using this roll-on. Apply a thin layer of serum over your affected areas two to three times a day. It won’t hurt if you directly apply it on your blemishes. If the product causes your skin to dry out or become irritated (which it usually doesn’t), you should shorten the use of it to only once a day. Your blemishes certainly won’t disappear overnight, so try to be consistent with its usage. If zit zapper continuously dries out your skin, apply a moisturizer (that doesn’t aggravate acne) on your skin after using it. Now that concludes our quest for the best drugstore acne products you can get without spending a fortune. I did list the top 10 products that are easily enough for you to choose from. However, I believe that nothing is complete.